Phil Delavan, Mary Ann Colf and Ed Bolden participate in the Santa Clarita Valley Rotary Club workday held at the Santa Clarita Valley Historical Society's Heritage Junction in Newhall. .
uesters chapters 381, 334 and 952, under the direction of chairwoman Judy Holland, recently invited the Santa Clarita Valley Rotary Club to assist club members in working on the interior of the Edison House located in Heritage Junction in Newhall. Heritage Junction is a collection of historic buildings in various stages of renovation by the Santa Clarita Valley Historical Society. Th Edison House was built by the Southern California Edison Company to house employees in 1919 when the Edison substation in Newhall opened. 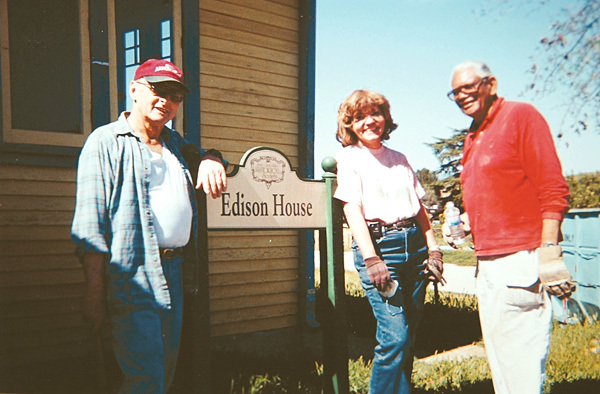 Edison donated the single family residence to the SCV Historical Society in 1989. The house has been waiting for local organization to take on the renovation as a volunteer project. The Rotarians took only two working days to gut the house of it plastered walls and ceilings. The next phase of the project will include new plaster and electrical. Questers were responsible for the complete interior and exterior restoration of the Kingsburry House located at Heritage Junction. Heritage Junction is open to the public Saturdays and Sundays, 1-4 p.m. For information visit www.scvhs.org. ©2003 SCV HISTORICAL SOCIETY / THE SIGNAL.